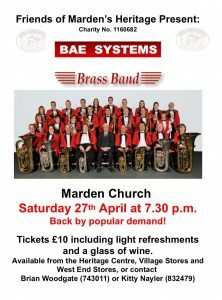 BAE SYSTEMS Brass Band is based in Rochester Kent and has played in concert halls throughout Southern England as well as travelling on the continent performing concerts in Holland, Belgium, France and Germany. Prestigious engagements have included performances at Canterbury Cathedral, Grosvenor House Hotel, London parks and the band has represented the company at Farnborough Air show and the International Festival of the Sea at Portsmouth. We are a busy band involved in fund raising and charitable concerts as well as preparing for brass band contests. Tapes and CD’s have been produced (details of which can be found on the “Our Productions” page) as well as a BBC broadcast. The personnel of the band have been together for many years. Mothers, fathers and offspring are members along with a number of couples who have all met, without exception, as a direct involvement with music. No member of the band receives payment of expenses but plays for the enjoyment of making music together. “BAE SYSTEMS Brass Band – helping to keep music a living experience” is the motto of the band and it is the hope of all members that, while you browse our website; listen to one of our recordings or concerts that the enthusiasm and excitement of playing music is portrayed.